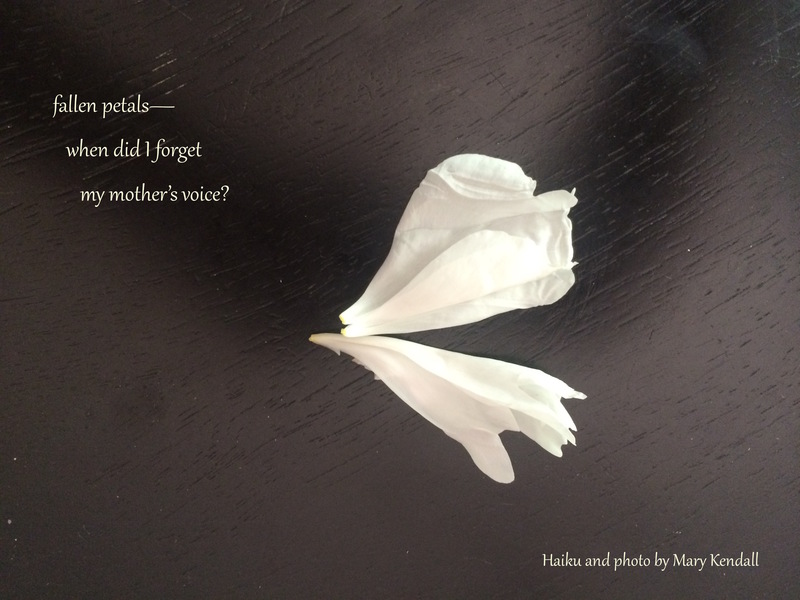 This entry was posted in death, Finishing Line Press, flower poem, haiga, haiku, poem, poems of loss, poetry and tagged death, end of memory, ephemeral beauty, forgetting, grief, melancholy, memories of my mother, mother's death and loss, remembrance, sadness and loss. Bookmark the permalink. This is such an amazing write. Powerful and heartfelt. Beautiful & poignant. No, I can’t remember my mother’s voice but, but I do remember so many of her words. Yes! The words never, ever leave, do they? Thanks for commenting. Beautiful! I barely remember her voice, but she is always in my heart! Precious memories!!! Brought back memories of my mother who passed in 2007. Thank you for such a gentle reminder of those no longer with us. You touch my heart with your words. Very, very lovely, Mary! Linking the falling petals to forgetting your mother’s voice made me sad. It is a sad haiku, I know. I appreciate your taking the time to comment, dear Robin. That is both sad and beautiful, Mary. We are blessed when we have mothers who loved us and whom we loved so much.